KEEP CALM AND CARRY ON: How To Make Spring Count... Or Try To. How To Make Spring Count... Or Try To. Hammocks are heavenly, aren't they? I told you all that I would be getting use out of this! 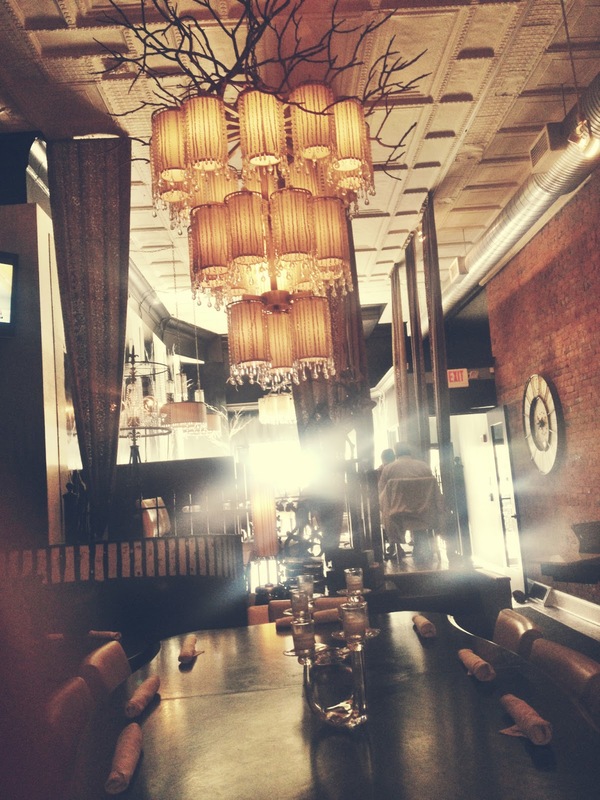 This weekend we tried a new restaurant, called deNOVO Bistro and Bar, that was on our list of places to go. It was my girlfriend's birthday brunch and I couldn't get over the rustic chic decor and they had fabulous food. not pictured was both me and Billy meals....are you ready for this? Yep...I'm serious. It was SO GOOD! No explanation needed. All you gotta do is grill out then eat outside for dinner. It equals instant happiness! This week I'm going to share a lot of recipes/things I eat during the week since many of you have asked about that. We also tried a new brewery, Seventh Son, this weekend with some friends. It was awesome! I went out of my comfort zone and ordered a darker beer and really liked it. Normally, I stick to the lighter brews. This one hasn't happened yet. But he's supposed to start this week! My next task is to find us some new outdoor furniture for our deck! We have had our current furniture ever since we moved into our house and it was actually left for us from the previous owners, so I hope to get our own that we love. I have gotten a lot of inspiration for garden furniture from here. They have so many great options and ideas of how you can spruce up your outdoor areas! I also hope to put my somewhat green thumb to work in our yard this upcoming weekend. I actually really enjoy working in the yard, so it's not much of a chore for me, but it really needs to be done. I hope it'll be warm enough this weekend to do so! How are you making your spring count? Linked up with miss Sami today-you should too! You can still watch this video and at the end enter for your chance to win big $! Go watch here, ladies! Trying out new places for brunch is def on my list of to do's as well! Have a great week! This a a great list and a reminder that I need to start doing most of these, especially trying new brunch places! I love my hammock but I'd really love it if I could get my dog up there with me! One day! Go Columbus Go! I've never heard of these new brunch spot, but I've seen a bunch of people post about that 7th Son place. Also, can we talk about your Strawberry Salad....umm..YUM! all of those amazing food pictures, the idea of a brewery, and swinging in a hammock make it really hard to focus at work today ;) i'm loving your springy-ness around here! happy monday, doll face! Your post makes me so happy today! Here in Iowa it has been cold, windy and rainy for about the past month. We just can't catch a break! I need some sun!!! Your weekend looks absolutely amazing!! I wanna come back to Ohio and do all these spring things with you!! :-( Its almost been a full year since i was there---MISS IT!! your spring to-do sounds really freaking awesome. I love that you love to grill out! thats one of my FAAAV parts of spring/summer! running outside; yes yes and yes! Loving that color block top in the first picture! Well spring hasnt arrived in Chicago yet...its been cold, snowing, raining and last week we had major flooding...so over it!! It's FINALLY getting up into the 60's here this week..winter has been too long for us! Which means I'll finally be able to go run outside! My husband's parents live in Columbus - that deNOVO place looks like something we should definitely hit up next time we are in town! Brunching is high up on my spring to-do list. Mimosas are a fabulous way to start off a day!! So jealous of everything going on in this post. Can't wait to have a little backyard where I can hang up a hammock! I've been wanting one for YEARS now. Ugg. Made my own little acrylic tray you shared in that tutorial a while back, finally. Thanks, girlfriend! Sounds like a great way to enjoy spring. I wish I had a lovely tree to hang a hammock! You look so comfy! Oh I do love spring and if it ever gets to Boston I will do some of the things you mentioned! Haha! Love that hammock! Wish we had a tree to hang one on! We have getting rocking chairs on our list! I love hammocks!!!!!!! Cooking out and then laying in the hammock is seriously my favorite part of summer! Especially with a good drink (or 5). Well pretty lady you are knocking those things out left and right. How about you add to your list...go back to Texas to visit Steph and Shay, and then travel a little farther south and visit Ashley (me) and style me pretty...what do ya say?! hehe Happy Tuesday eve my dear! grilling out is probably my favorite spring and summer time activity! Okay this post has made me decide that I definitely need to invest in a hammock! This spring has been bitter sweet. Normally the pollen is so thick I'm busy dealing with a cranky husband who's allergies are on fire. Since he is deployed right now though, I am LOVE LOVE LOVING the fact that I can leave my windows open. Bring on the fresh air (and pollen!). Great spring to-do list! I really want to go biking more and go on picnics! Mimosa's make me happy and I love when it was warm enough out to need iced coffee!